In addition to learning another language, eighth-graders in Janice Kincaid’s Spanish classes at Berner Middle School in the Massapequa School District are also learning how to be good citizens of the world. During the week of May 7-11, students sold bracelets during lunch periods to raise money for a pair of charities. Proceeds from the sale of several hundred “pura vida” bracelets, which totaled more than $1,000, will benefit Convoy of Hope and Water for People. An expert on nonprofit organizations spoke to Ms. Kincaid’s eighth-grade Spanish classes about charitable contributions and how to find the right charity to donate to. She showed students how to research different charities to learn how the money is being spent. Ms. Kincaid then charged her students with selecting charities in which at least 80 percent of donations is spent supporting the cause, and ones that benefit people either in Hispanic communities in the United States or in Spanish-speaking countries. After a student vote, they chose Convoy of Hope, a humanitarian organization that provides food and water to the impoverished and helps with disaster relief efforts, and Water for People, which provides access to clean drinking water to people in nine countries. “Clean drinking water is important for people to have a good life and be healthy,” said Kristen Froller, who along with Caitlin Hannan and Aly Harding did the initial research on Water for People. 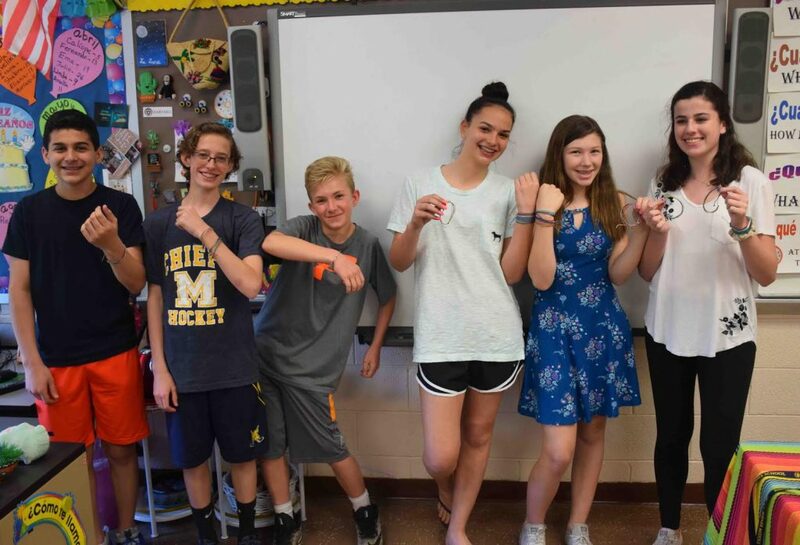 Photo caption: Berner Middle School eighth-graders sold bracelets to benefit a pair of charities.